What does Solid Gold Northland’s Facebook page and a 10 oz. 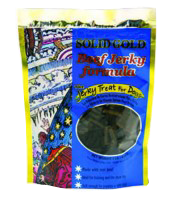 bag of Solid Gold Beef Jerky have in common with Chuck & Don’s Pet Food Outlet’s event, The Fourth Annual Pins for Pets….bowl for the fix Fundraiser? We’re working together to create a winning situation for pets. Each year Chuck & Don’s Pet Food Outlet hosts an annual event, Pins for Pets…bowl for the fix Fundraiser, a benefit to help reduce pet overpopulation. This year’s recipient is Minnesota Spay Neuter Assistance Program, Inc. (MN SNAP), who’s mission is to end the suffering and death of homeless animals due to pet overpopulation by providing high-quality, affordable, and accessible spay and neuter services to Minnesota shelters, rescue organizations, and the companion animals of the low-income community. Donate $1.00 to Pins for Pets at any MN Chuck & Don’s Pet Food Outlet. Present this coupon at any MN Chuck & Don’s Pet Food Outlet location for your Free Beef Jerky with your next purchase of any Solid Gold product. Hurry offer expires 8/15/2011. How easy is that? Everyone, especially the pets, wins when you do this.